The first rung on the BASI ladder. Receive the best ski tuition on your way to a ski instructor qualification. The Level 1 Instructor course is the first instructor qualification within the BASI system of training and grading. It is the initial step on the route to becoming eventually an internationally recognised Snowsport Teacher. The course aims to provide you with the basic information and skills which will enable you to develop your practical performance, prior to returning for the Level 2 Instructor course. Your personal contribution will be an important aspect of the course. In BASI we are passionate about our role and our snowsports. We want you to enjoy the course, learn the fundamentals and have a great time. It’s really vital that you prepare yourself for the course both physically and mentally. While we don’t need you to be superhuman athletes, we would advise you to make sure that you have prepared yourself physically and be able to spend five hours per day on snow. The mental demands of this course should not be a concern, but will require your ability to concentrate and participate. You will find the manuals and training material provide the information you need on the course. 5 days of quality training. Assessment to the BASI Level 1 criteria. Be able to ski parallel confidently, coping with a variety of conditions and are advised to have completed at least 16 full weeks of skiing. Be able to ski parallel confidently on red runs, making rhythmical turns close to the fall line at a steady pace. Awareness of the structure of snow sports in the UK and internationally and organisations involved in the structure. A qualified BASI/ICE trainer will run your course. 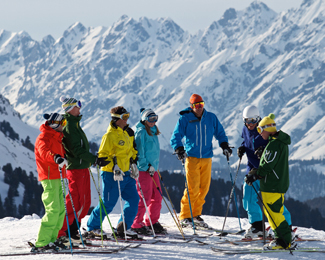 Trainers are selected by BASI for their skills in skiing/boarding, teaching and communication. During the course your trainer will continually assess you. The trainer’s objective is to provide you with an end of course assessment of your personal performance. Delivery of the syllabus will take different forms. Training will primarily take place on the snow and be supplemented by lectures, tutorials and video review normally in the evenings. The daily programme will normally comprise of five hours on snow/slope, two hours off snow in the evening and one hour of student self study. On completion of the Level 1 Instructor course you will be registered on the BASI database as an Associate Member. As an Associate Member you will receive copies of the in house journal: BASI News. Membership is renewable annually on payment of the appropriate fee in October each year. Successful completion of this course will mean that you become a Level 1 Instructor. As such you will have been trained in the basic skills, knowledge and understanding of a snowsport instructor without any experience. You will receive a licence to teach snowsports in a non-mountain environment, i.e. Uk dry slopes or indoor snowslopes. It should be noted that to obtain your Level 1 Instructor qualification, you will need to provide BASI with proof of 35hrs of logged ski school experience (once having attended your Level 1 course) First Aid certificate and Child protection module. In the run up to courses we are often asked a great many questions about equipment and clothing. Our experience of clothing leads us to believe that the layered concept is the most versatile. We do go out in all weathers and therefore a breathable waterproof outer layer is preferred. You should always bring sufficient layers to cope with a variety of temperatures. Though, it must be said, that heat stress in November is rare, whereas, it can be a problem in April. Snowsport equipment and boots should be as good as you can afford. Boots need to be a compromise of complete comfort and performance. Modern equipment should be good quality and fit for purpose.